VNU-EPT (VNU-HCM English Proficiency Test) is a test designed with standards of an international English test, based on the Common European Framework of Reference (CEFR) from the basic level A1 to the proficient user level C2, in order to evaluate test-takers’ general English proficiency (14 levels). The test is administered in two ways: paper-based and computer-based. The test consists of 4 sections: Listening, Reading, Writing and Speaking. The Listening and Reading sections consist of four-choice questions; the Writing section is in the paragraph and essay format; and the Speaking section is in the monologue format without examiner-examinee interaction. What is the difference between VNU-EPT paper-based test and VNU-EPT computer-based test? You have 165 minutes for 3 sections of the test including Listening, Reading and Writing. The Speaking section will be conducted before or after the 3 mentioned parts. One by one, you wait for your turn to present your responses directly to the examiners. 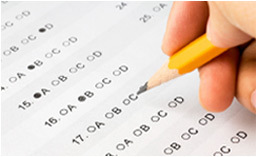 The 4 sections of the test will be conducted consecutively in about 180 minutes. You will present your responses into a microphone and they will be recorded in the computer. In general, all 4 sections of the test will be included in one session (about half a day). However, depending on the number of examinees, the duration of the test can be divided into 2 sessions: one session for Listening, Reading, and Writing, and the other session is for Speaking. Computer skills are not required. Some basic computer skills are required, especially the typing skill. How long is the VNU-EPT valid and where is it recognized? The VNU-EPT certificate is valid for 2 years and is accepted within VNU-HCM and other training institutions as well as organizations upon request. Which score is needed to pass the VNU-EPT? There is no pass/fail score for the VNU-EPT. It depends on the user’s purpose. For example, according to the requirement of the VNU-HCM, non-English major university students are required to have B1.2 level of English proficiency or equivalent as an exit requirement. Therefore, if a student of VNU-HCM chooses to take the VNU-EPT, he/she must have at least the score of 176 in order to meet the requirement. Does the VNU-EPT set age limits? There are no age limits for the VNU-EPT. However, you are required to present an identification card. In case you are under the age of an ID card holder, your passport or other personal documents with photo are required. How long does it take to get the VNU-EPT result and certificate? No later than 3 weeks after the test date, your result will be posted on the website of VNU-HCM English Testing Center (VNU-ETC). 4 weeks after the test date, your certificate and score report are available at the VNU-ETC or where you registered for the test. You must bring your candidate card and a personal document to receive your certificate and score report. If I miss 1 section of the test, can I reserve the result of the other 3 sections and register for a new test to do that missing section only? You must complete all the 4 sections of the test. If you miss any section of the test, you are considered to cancel the test and your finished sections will not be scored. If you want to do the test again, you must register for another exam and have to complete all the 4 sections. Is there a score review for the VNU-EPT? There is no score review for the VNU-EPT. Am I allowed to take breaks between the sections of the test? During the paper-based test, you must finish 3 sections Listening, Reading and Writing in 165 minutes continuously without any break. You may go to the restroom during the test under the permission of the proctors. During the Speaking section, you may go out under the permission of the proctors while waiting for your turn. During the computer-based test, you must finish all 4 sections within 180 minutes continuously without any break. However you may go to the restroom during the test under the permission of the proctors.